We’re delighted to receive such amazing praise and reviews from clients as we strive to make their New Life in Australia a reality for Migrating to Australia is one of the most stressful endeavors any individual or family can embark upon. We are always humbled when a new client chooses to place their faith and trust in us and we go out of our way to deliver at all stages of our engagement. We believe in a truly egalitarian approach to Migration: If you have the right skills, experience, expertise and drive to start a new life our commitment is to help you every single step of the way, which is why clients usually become friends at the end of the arduous process. We’ve been invited to Weddings, Birthdays, Bar Mitzvahs and Citizenship Parties among other social engagements and it’s truly wonderful to see our efforts ‘come to life’ in our clients’ new adopted country. Thank you to Australia Made Simple and Alexander in particular for all that you've done for my family. Highly recommended. You're very welcome Steve, it's been a pleasure and we are all thrilled with the result. Will definitely be using Australia Made Simple when its time to get my application started. Just had the best free consultation. Thanks again you cleared up lots of my questions and then some I didn't even know I needed to ask. 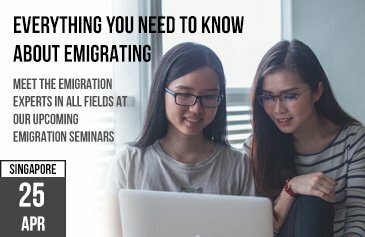 Do you have any seminars scheduled in the UK? I can't make Dubai as I'm in Singapore with work but would love to know when you're running some seminars in the UK. Thanks. We're planning to run a full UK Seminar Schedule in 2019 alongside our International Schedule and will post details when we have them. My visa just came through - thanks to Alex from Australia Made Simple. I'll be in Australia after the summer. I'm planning my farewell weekend with my mates already, maybe heading to Spain for a long weekend. But most of them are already planning holidays to Australia now they will have somewhere to crash. I'll now get started applying for Plastering jobs in Brisbane and the Gold Coast and maybe Perth, those are the places I would most like to live, but I am not too fussy. I've never even been to Australia and now I'm going to live there. I'm so happy, though my parents might be a little jealous, they are wanting to look into how they can move over with me. Alex can you do that for them? I'll give them your number on the weekend when I see them for lunch. I think they thought I wouldn't get in so they didn't really think about it all themselves, but now I'm going it's all very real. Can't wait. Thanks again Alex, it really was easy going through you. Life changing for sure. Cheers. Hi Thomas, thanks for the comments, and yes give your parents my number and I'll go through the visas which might suit them. Would be great for them to head over with you or once you get settled. And certainly get a large sofa when you land in Australia, is sounds like you will be having a procession of friends out to visit you. Very happy for you. Amazing service thank you so much. Truly inspirational customer service, very impressed and will recommend. Thank you Australia Made Simple and Alex in particular for answering all my questions and being very patient with me. I was very concerned because even though I know I am eligible to emigrate to Australia as a Nurse my husband has a disability which means he is unable to work due to his condition. I always knew deep down this was going to be a problem and many agents had told me not to worry that all would be fine but after speaking with Alex at length he explained the difficulties and complexities in the case. I am very grateful for his honesty because now we can look at other options. Thank you for taking the time to write your feedback. We pride ourselves in our transparency. Good luck for the future. 9 1/2 years ago I looked into moving to Australia and I could have, I was a qualified Electrician already with the needed experience, but I didn’t do it. Last year I looked into it again and actually decided to do it. I had Australia Made Simple handle it for me. They were great and got it done. Now I am here I just wish I had followed through all those years ago. Better weather (though not hard to have better weather than Leeds really), better pay, brilliant lifestyle, plenty of work and would you believe the ladies like my accent here. Life is great. All I can say is if you are thinking of making the move, do it, as it really is that good over here. Thanks Mark, so many people regret not making the move sooner, but the main thing is you are there now, accent in full force ! Brilliant. Our Visa just came through. Downhill run to Australia now. Can’t wait. Off to celebrate this weekend with the family. Then on to the start of the packing and selling things on ebay and planning where we are going to live and where the kids will be in school. Been an easier process than I imagined, mostly because Alex from Australia Made Simple has handled it all for us. I don’t know why anyone would put themselves through doing the process alone. I’m on to looking for jobs now, as a carpenter and working out which tools I’ll ship over there and which I’ll sell here and buy new there. 1st world problems and decisions! Brilliant result for us, Thanks Alex. Thanks Robert, yes great news, always so exciting when the visa comes through approved. It is all downhill now, enjoy celebrating and let us know anything we can do to help with your planning of the details of your move. Amanda, our resettlement advisor can help with a lot of questions you may have. Big Thank You to Alex at Australia Made Simple for getting my visa to Australia sorted. I’m here now - starting my new life. I made the decision to move after I split up from my wife 2 years ago. Was time to live life the way I wanted rather than for anyone else. I’ve already got a job lined up , starting next week and I’m getting going on my Australian Context to move from the provisional license to a full Australian license - that should be done in a couple of months in and around work. That is the last piece of the puzzle. So far I’ve found Australians to be friendly and helpful. The weather has been great of course. Not sure where I might end up living long term, I really like the beach but also the countryside, would like a house on a few acres maybe. It’s all available to me, but for now I’m starting off in Brisbane. Thanks again, now on with the new life. Great news Neil, walked into a job already - well done. Enjoy kicking off your new life in Australia and “window shopping” for where you might like to live within Australia long term. Please keep us posted on your progress and good luck getting started next week with the new job. I HUGE thank you to Alex from Australia Made Simple for the amazing work on getting my family and my brothers family all to Australia with permanent residency visas, all inside of 1 year start to finish !!! I applied under nursing for my husband and our 3 kids, and my brother is an Electrician so he applied for his wife and their 4 kids! All 11 of us hahaha. An incredible amount of documents all just sent off to Alex who did EVERYTHING for us all. I can’t image how we would have got it all done without him. The process was so smooth and we all had our visas “called forward” inside a year. We all moved into the same suburb in outer Brisbane on the water called Redland Bay. I’m working in a full time role already, my husband is working as a retail store manager, my brother is earning more as an electrician here and his wife is working part time as a bookkeeper. All the kids are in school, 4 in primary and 3 in high school, and we are looking to buy a home here really soon. We are spending our weekends house hunting. I am so grateful to Alex for all he has done for our family and our future. Everything went according to plan and life is great. Next step is to move my husbands niece out here, she has just graduated as a secondary school science teacher so she has some work experience to gather first - but as soon as she does we will be getting Alex on the case so she can join us. So thanks again, for handling such a big group of us so well. You are part of our family history now and we are so very grateful. If I could give you more stars I would :). Thank you Tracey, yes your application was a big one ! It was an absolute pleasure working with you all, a lovely thing to see an entire family making a move together for a better life. Was wonderful being involved. Good luck with the house hunting and looking forward to helping your niece when the time comes too. I have been dealing with Amanda at Australia Made Simple, my visa has just been approved. She has been incredibly helpful and professional during the entire process. I do tend to get a bit nervous at times and Amanda has calmed my nerves a number of times and explained things again and everything has gone exactly as she said it would. I am very happy and excited and a bit nervous about my move to Australia. A new life awaits me. I can recommend Australia Made Simple to any teachers looking to move to Australia. Thanks Marion, the process of emigration is certainly an emotional process at times so you are not alone in getting butterflies during the process. It is a major life event. Congratulations on your permanent residency visa and in the new life that awaits. I am so pleased with Amanda and Australia Made Simple. Our application has progressed so smoothly while a friend who applied before us has hit hurdle after hurdle on hers. Amanda handled all our documents and paperwork. It’s really been easy, however I’ve seen how much there is to be done behind the scenes through my friend who is doing the process herself. Our visas are already approved and hers is still in preparation of expression of interest stage. She is considering just giving up because it is overwhelming. I’m so glad we chose to go with Australia Made Simple, however I might never have known how much goes in behind the scenes if my friend was not doing an application at the same time. It’s been a wonderful experience and Amanda certainly knew everything that was needed for the application based on my nursing career. Very impressed. Thanks Karen, and yes there is so much that needs to be done in the immigration process. It is very detailed and quite complex at certain points of the process. It is designed so that only the most keen applicants make their way through the process. We try to make it as simple as possible for our client's by doing all the heavy lifting and detail of the process. I’m so glad you are happy with your outcome and off to Australia soon. Got to Australia then had to come back home for a year - about to head back to Sydney soon. The GREAT thing about obtaining permanent residency in Australia through Australia Made Simple is that it is PERMANENT! I had not fully realised the benefit in that. I got my visa 3 years ago and moved to Australia, found work as a nurse and loved it. Then my mum got sick about a year ago. I left my job and came back to England to look after her. The good news is she has made a full recovery and is well again, and what’s more is that I can now simply get on a plane and head back to Australia as I am a permanent resident. I can come and go as I please…..forever. I am so very glad I chose to go the permanent residency route and I plan to go for dual Australian Citizenship as soon as I qualify too. I’ll be heading back to Australia soon, thanks to Australia Made Simple for taking the time to explain the benefits of permanent residency to me at the start of the process as it turns out the benefits applied to me in this case. That is wonderful news about your mother’s recovery Mary, and yes, the permanent residency offer is very helpful in all kinds of circumstances such as your own. That realisation that it is permanent and you can come and go as you wish is an important element to consider when choosing a visa to apply for. Enjoy your trip back to Australia. When I first spoke to Alex I was 2 months off my 44th birthday. He explained that 45 is the cut off for the permanent residency visa for Electricians and all other trades too and that the Australian Government take the age at the time of acceptance of the visa which is at the end of the process and can take a year ! I was panicking and thought I had missed out on my chance to move to Australia and live. But Alex got us all into go mode. Everything was fast tracked and he was on top of it all getting done and in within weeks. He did everything. And we made it ! I got my visa 3 months before turning 45 and being cut off ! Just amazing. I would never have made it without him. Please pass on to Alex my thanks and don’t leave your own application so late like I did. Still, a happy ending for us, and we are moving in about 6 months after we sell our house. We plan to move to Perth just as our daughter starts high school there. We are all excited and are so glad we did not miss out. Hi Richard, and thanks for the kind words. It was certainly a rush to beat the deadline, but you were very cooperative with getting your documents in on time and treating everything with the urgency it needed. Good luck with selling your house and with the move to Perth. Let us know how you are progressing in the lead up as we can help you setting up your bank accounts and such to make it as smooth as possible. Thanks again for taking the time to comment here. Amanda from Australia Made Simple did our permanent residency applications for us. I’m a Nurse and my husband is a Bricklayer, so we both had to do our skills assessments and passed to get our accreditations for Australia. We were accepted to Australia so fast - Amanda told us to expect to wait maybe 6-8 months - we were called in 3 after the application was submitted. As it all happened so fast we are waiting for about 9 months before we head as we want to sell our house and have the kids finish the school year. We were so impressed. Money well spent for a great service. Thanks Amanda. Hi Rachel, Thanks for the kind words and good luck with the house sale. Do let us know when it’s getting close to move time and we can help you with some of the details of getting settled, bank accounts, school application processes and such. We have been here for 6 months now, and things are great. I have started my own business and have been getting the core of my first work from real estate agencies needing work done on the rental houses they manage. I’ve been doing all kinds of domestic Electrical work and am going to be joining up with a mate who is a plumber and about to arrive in Australia too and making a specialist service for real estates as they keep telling me they can’t get plumbers either. Then we just need to find a Carpenter and we will be able to cover most of the needs of the real estate agencies I have been working with. I didn’t even have my own business back in Dublin, but here I am, a self- employed businessman at 27. My wife has been loving it here too, she is working as a beauty therapist assistant and doing her certificates and hopes to open her own salon too one day. Best decision we ever made to move over here, thanks to Alex and Australia Made Simple for helping make it happen for us. Brilliant news on the business front David. Well done, I’m sure you will go from strength to strength, and pass on our wishes to Anna on her new job as well. Please keep us posted and all the very best for the growth of your business. I got my visa for permanent residency in Australia 2 years ago on the back of my plumbing trade. Australia Made Simple were great and did everything for me. I would recommend them to any plumbers looking to move to Australia. And to any plumbers looking to move to Australia I would say DO IT! A much better life all round over here. Thanks Bill , great to hear from you, it’s been a while. Wonderful to hear you are enjoying Australia and thanks for the recommendation. Amanda at Australia Made Simple was so very helpful, friendly and professional in handling our visas to Australia, she made it so easy for us, even while we were in an incredibly busy time in our lives. We have 4 kids under 8 and I have been handling the process that we are making under my husband's position as a mental health nurse. We have been accepted to Australia and can’t wait to move. We truly believe it will be the best future for our growing family. We could not have done it without Amanda. My parents will be helping us with our flights to move and they hope to follow in a couple of years. I will have Australia Made Simple handle their visas as well. Thanks again from our family, you will be in our hearts forever. Thanks Melanie, and I am so happy for you all. I know it’s been a hectic time in your life and can see now moving to Australia can really set you up for the future you hope for. You have been an absolute pleasure to work for. I thought I would do my application for permanent residency to Australia myself, but after looking at it, I realised it could get quite hard. I had a mix of working for myself and other people, and one of my old employers was no longer around. Was going to be a nightmare to sort that out and for a bit I thought that would rule me out of qualifying. Alex at Australia Made Simple was great, handled everything. Best decision I made. It all went well and took 10 months from when I first started with Alex to when the visa came through. I’m now in Australia working as an electrician just outside Melbourne. Pay is better, people are friendly, I’ve just bought by own house and generally getting ahead. Thanks Richard, great news on the house purchase and thanks for the kind words. Wonderful to hear all is going well in Australia. I’m a carpenter and been in Australia almost a year now. I used to hate mornings back in London, leaving for work in the dark and cold, getting home in the dark and cold. I can’t explain how much my life is different here. I can’t wait to get up in the morning and off to work. It’s warm, there is light, it’s pleasant. After work I can do things. I’ve joined a football team and we play outside all year round and it’s warm! On weekends I have BBQ’s, I’ve been on hikes, to the beach, exploring the countryside near the gold coast where I am living now, and it’s always sunny and a great day. You can’t believe how sunny the days are here, even in winter, beautiful days. So now I bounce out of bed and to work. It’s now my favourite time of the day. Australia does not have enough trained carpenters, they are giving qualified carpenters these special visas to live in Australia permanently and work. It’s amazing. I wish I knew about this sooner as I would have moved years ago. The best thing about Australia is …. The FOOD, second best thing is the men ;). I know everyone says the best thing about Australia is the weather - and it is great - but I think the best thing is the food ! Everything is so fresh, so much variety and so delicious. I have been so impressed. Just thought I would add that. I’m a nurse and been here for about 4 months now. Amanda at Australia made simple handled my case and was amazing. Everything went well. Not so much as a hiccup in the process. Really now living my dream life. HAHAHA Sarah, thanks for your comments, I have to agree, the food is amazing in Australia…..and I’m sure the men of Australia are very grateful for the compliment too :). Thanks Tom, next step is underway already. You have been great to work with. Thanks Terrence, it was an absolute pleasure working with you. I’m now in Perth, moved from Cardiff last year. Amanda at Australia Made Simple handled my entire visa process. All went without a hitch and here I am. Thanks Amanda - you said life in Perth would be great and it is. Thanks Gregory, this is wonderful news. I remember you saying you were planning on joining an AFL team when you got out there. Have you started your Aussie Rules sporting career yet :)? ""HAHA you remember that !! and YES I have….but the season just started and it is a bit hard to time it with the shift work I’m on currently. I’ll send you a photo when we get started. - Gregory""
Thanks Ron - that is a great description, yes that is exactly right , Australia only offers these very generous permanent residency visas because they are short of those particular trades, meaning that there is generally work available for them. Thanks for making it all work so easily. You are most welcome Melissa, thank you. Who knew I could get a visa to Australia because they need Plumbers over there? Go get ‘em Brett. You are going to take Australia by storm. You will love it and Australia will love you. Do send us that selfie (or postcard if they are not yet extinct). The best thing is you are there now Bill, congratulations on the move and settling in well. Thanks for keeping us posted on your progress in Australia, nothing makes us happier. Congratulations on your engagement Rose ! That is wonderful news, thanks for letting us know. Adelaide is a beautiful city indeed. Enjoy that greener grass and your Australian future. Send us a wedding picture when the time comes, we would love that. 24 year old Electrician - moving to Australia by myself, visa now granted !! You have a really adventurous spirit Ayden that shines through and will surely keep you succeeding in your new life in Australia. The waves of the Gold Coast wont know what hit them :). Enjoy. Thanks Brian and it sounds like you are thriving out there. I am confident Thomas will be out there with you soon and he and Sarah have kept me updated on some of the fun you have been up to while we have been working together on their application. It’s easy to see how close you and your brother are and we will make sure you are living nearby again soon….in Sydney. Lots of extra advice and help about the details of moving and living in Australia - they provided much more help and support than I expected. Thanks Sarah, yes all the extra info from our relocation support team really does make a difference, great to see it helped you have a smoother transition. Thanks for taking the time to comment here, much appreciated. 2nd application to move to Australia - glad I chose Australia Made Simple this time - success ! Thanks Samantha, glad we got you the result you were after. All the very best of luck with your move and your interviews for the new positions, let us know how you go. Congratulations Simon. I am sure Belinda and yourself will be very happy in Australia. Was a complete pleasure working with you both. Thanks Bradley. An experienced nurse such as yourself is in high demand in Australia, as you have now experienced or yourself by walking into a job so quickly, well deserved. Glad to hear the kids have settled in so well and that the sun is shining in Brisbane. Thanks for taking the time to write to us. Keep us posted on your progress.